Should not acupressure point TW5 be a centimeter more proximal? Sorry, Mr. Rawlins, but I must chime in before this thread gets out of hand. 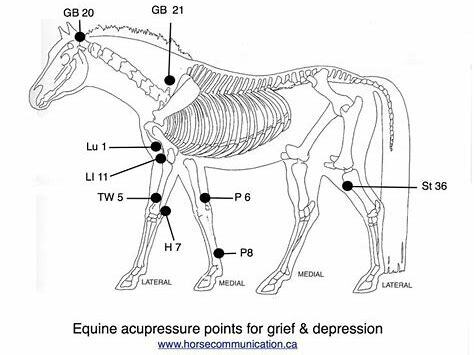 Yes, the figure is not accurate, but if you knew anything about horse psychology, you would have seen that the REAL acupressure point TW5 is located 1 cm DISTAL, not proximal! Thank you for demonstrating how ignorant you are! Please leave discussions about such serious issues to the professional horse whisperers. Then I got to the punch line. My friend coined a term to describe how a proper veterinarian assesses these charlatanistic practices….He uses his “BULLSHITOMETER”. The modalities you cited above all seem to spike the device into the complete BS zone. This is absolutely amazing – in fact, it’s bordering on the bloody miraculous. Because horses don’t have a gall bladder. interesting but irrelevant, because horses, like humans, also have no meridians. You are, of course, absolutely right. Yet there is a qualitative difference: those meridians are claimed to be non-tangible in any case, so that our holistic friends can keep insisting that they’re there. Gall bladders, on the other hand, can simply be pointed out in many species – but not in horses. Which makes it all the more clear that our holistic friends are talking nonsense when they refer to a horse’s gall bladder. What seriously? I knew horses don’t have gall bladders because it comes up a lot in jokes about not extrapolating from animals to humans. But someone actually wrote this down?! It reminds me of the triple burner, which apparently is a “conceptual” organ. I would like to know where the REN-1 point (AKA: “Conception Vessel 1” and “Huiyin Meeting Place of Yin”) is located on the horse. I would also want to know what it is used for? In humans it is partiularly useful for resuscitating the victim of drowning. It also works for constipation, erectile dysfunction and related disturbances. If the point is anywhere close to the correspoinding location in humans (See under “Location” in the webpage linked above) , I guess you have to wait till the horse is rather unrespoinsive before puncturing this panaceous point, the risk of being kicked would otherwise be prohibiting, I would think? Horses are prey animals. They have no instinct to fight back when serious illness occurs. They tend to shut down and die. Horses in our care depend on us to take care of them by giving them REAL medicine and REAL treatments under the care of REAL veterinarians. Joyce Harman, you are a heartless and, obviously, cognitively challenged charlatan. Selling this crap to unknowing and desperate horse-owners is shameful. Hand in your license (if you even have one) before you kill any more horses.